I’m back again with another layout for The Cut Shoppe! I came across this photo of my son from 2010 and absolutely loved his expression! 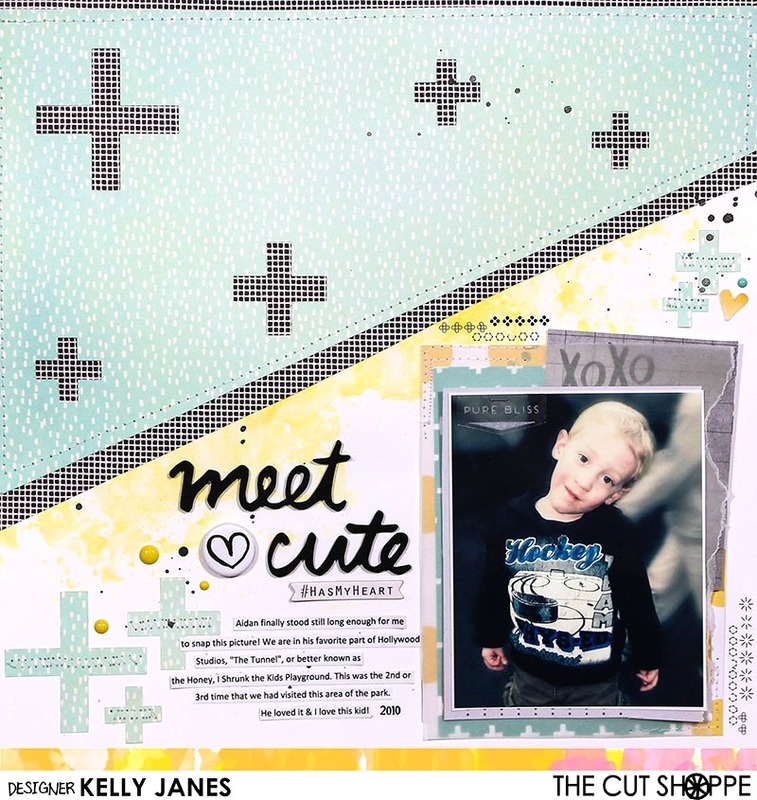 I started this layout by pulling the Plus Infinity Background Cut File into Cricut Design Space and slicing out individual plus signs onto a patterned paper from Simple Stories-Sunshine & Happiness Collection. I wanted to add visual interest that patterned paper so I backed it onto a black & white pattern paper from Amy Tan’s Stitched Collection. I then cut both of those papers at a diagonal and placed them onto a piece of white cardstock. I then started my photo mat which consists of lots of layers from my stash-including random pattern papers, vellum & pieces from the cut apart sheet from the Amy Tan Stitched Collection. I wanted to pull in a little more yellow to help bring out the yellow that is in the photo mat so I used a combo of Shimmerz No Yoking Coloringz & Heidi Swapp Mustard Color Shine. I then added my title from American Crafts-Amy Tan-Rise & Shine Thickers, a flair button from my stash & a scattering of the plus signs left over from the Plus Infinity Cut File. I also added a chipboard piece from Heidi Swapp & a fabric heart from Amy Tan. I wanted to add a little more visual interest around the photo so I grabbed a few rub-ons from Basic Grey. I added stitching, Black Heidi Swapp Color Shine & enamel dots. I’ve put together a YouTube Process Video so you can see how this all came together! Thanks for stopping by & remember to stop by The Cut Shoppe Etsy Store to check out all the cut files!